Painter and sculptor Reidun Aafløy Hansen is celebrating thirty years as an artist with a retrospective exhibition at the Bærum cultural center and a monograph to be published later this year. This is a woman who became an artist in midlife. After working as a maritime radio operator on the Seven Seas for many years, she felt a pressing need for a new orientation in life. She began her studies at the Einar Granum School of Painting and Drawing in 1972 and continued at Asker School of Art two years later. Reidun Aafløy Hansen made her decisive leap to become a professional artist when she began to study painting at the Norwegian State Academy of Art in Oslo in 1976. A long repressed desire to create images was finally realized, and a late blooming artist was underway. This was just a hint of a much greater achievement: After completing her studies in painting in 1980 under Professors Alf Jørgen Aas and Halvdan Ljøsne, Reidun Aafløy Hansen continued in her fifth year at the Academy studying sculpture under Professor Boge Berg, culminating with a student teaching position at the Minneapolis College of Art and Design in the US in 1982. In Reidun Aafløy Hansen's artistic career, we are witness to a self-realization project of outstanding caliber. Reidun Aafløy Hansen notes that in her years as a maritime radio telegraph operator, sailing abroad with her husband, Captain Thorbjørn Aafløy Hansen, she used every opportunity to visit art museums and exhibitions. Her appetite for art increased during her years as a practicing artist. After she received her diploma at the Academy, she studied History of Art at the University of Oslo from 1989 to 1991. For her minor subject paper, she wrote "Wassily Kandinsky - Abstraction as a form of representation". In 1992, she continued her studies in Classical Archaeology and earned her Bachelor of Arts degree. As a student - and ever since - she has been an energetic traveller in the history of art with frequent visits to major museums and collections of European art. She has also familiarized herself with art outside the European tradition; she particularly appreciates the simplicity of Japanese art and the power of expression in Aboriginal art of Australia and the South Pacific, as well as the stylized decorations of Peruvian ceramics. Sporadic traces of these influences have found their way to her canvases through the years. Her keen eye has captured some of the most significant expressions in world art, and she has been able to draw parallels with them in her own development as an artist. 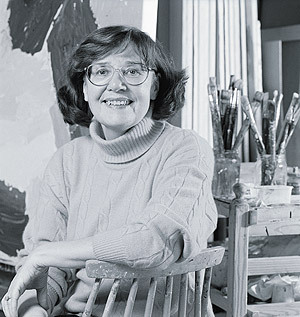 In her frequent early exhibitions in the 1980s, she had already begun to develop the means of expression that would hallmark her artistic career in the years that followed: She found endless possibilities in working with different artistic media, expressions and formats, with extensive use of selected central motifs and genres - heads, masks, figurative art and abstraction - and she combined this with a high level of activity. A wealth of expression has accompanied her throughout her very eventful artistic career. She has always been a high-energy person, and this has enabled her to maintain her intense efforts. Complex use of color filled with contrasts is characteristic of Reidun Aafløy Hansen's paintings. Any kind of refined painting in tone on tone is foreign to her temperament. She prefers distinct colors, and she uses black as a stabilizing element to anchor the painterly events to the surface of her canvases. In later years, she has also painted a series of watercolors with this same abstract approach. Reidun Aafløy Hansen's thirty years in art is a rare example of a woman following her inner creative urge. As a mature student, she felt an enormous need to catch up with what she had missed during her earlier years in another profession. Coming to art so late in life was a great challenge, and the scope of her growth and her learning process are impressive. Reidun Aafløy Hansen has been particularly successful as a creative human being, pursuing her dream and profession as an artist. To make a radical career change in midlife has, of course, been an immense challenge, but also a great opportunity. Her previous life experiences and sensations are valuable sources of inspiration, and the act of transforming those feelings into paintings is a modus vivendi that she has chosen for the rest of her life. succeed in developing their ideas in several different media." which simultaneously is percieved as a natural prolongation of Nordic Expressionism".